Automatically illuminate your flag at night with this energy efficient solar flagpole light kit. This kit comes complete with adjustable solar panel, aluminum flagpole with 9 LED lights, flag pole bracket and a US flag. No electrical wiring is needed, the solar panel will charge during the day in the sun and will automatically illuminate at night providing light for your flag. 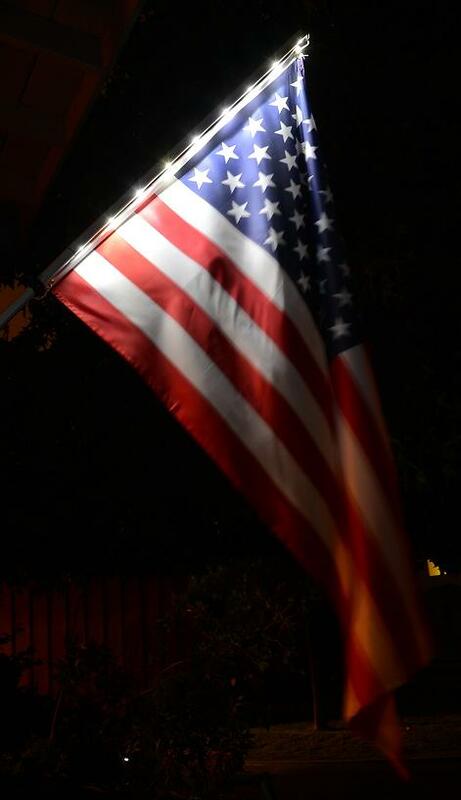 No need to take your flag down after sunset anymore, this solar powered flag light is a quick, affordable and easy solution to help showcase your flag. Express your patriotism at night with this Solar Night Flag!